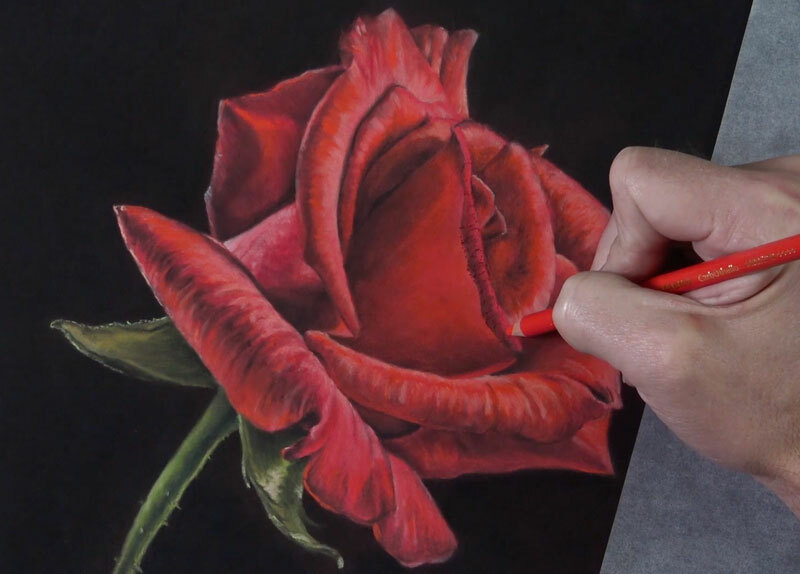 In this lesson, we’ll take a look at how to draw a rose with pastels. 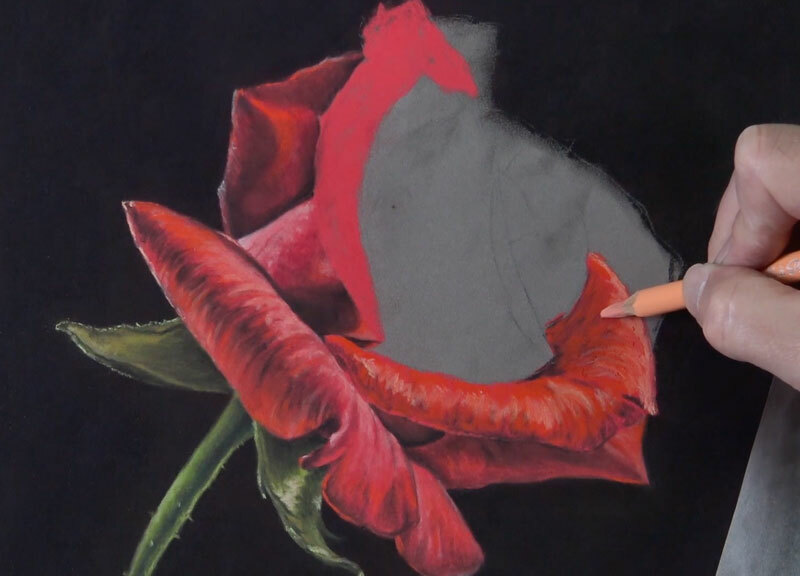 We’re using pastels and pastel pencils to complete the drawing, but the process and techniques that we’ll explore can be used for any other drawing medium with similar characteristics such as graphite pencils, charcoal, and colored pencils. 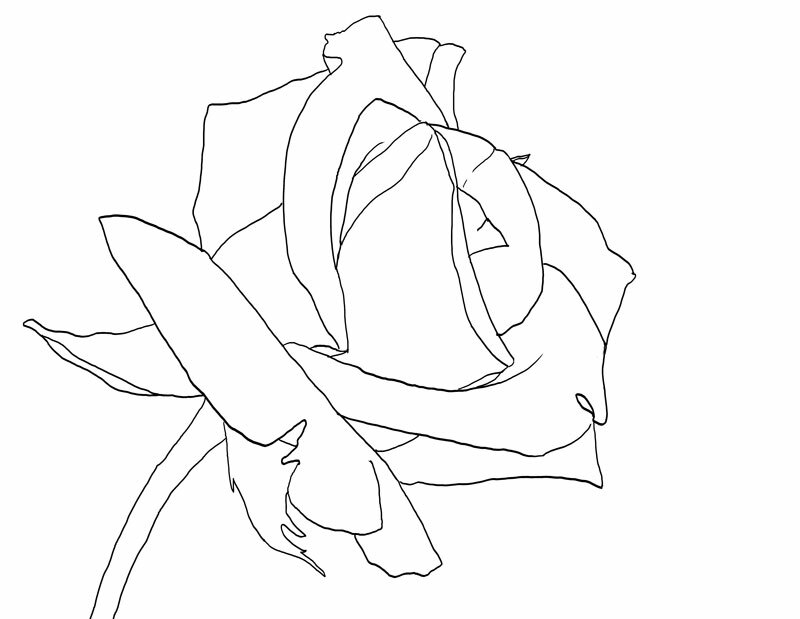 For this demonstration, we begin with a simple contour line drawing of the rose. This line drawing can be drawn freehand or you may choose to transfer the outline of the rose directly to the drawing surface. If you want to begin with the same contour line drawing that was used for this lesson, I’ve provided a template of the rose outline for you to use below. You may also draw directly from observation using this template if you prefer. This lesson features the use of several forms of pastels as well as several different brands. You may, of course, use any medium that you wish. The concepts that we explore here are fairly universal and can be applied to any drawing medium that you wish. But, before dive into those concepts and take a look at the step by step approach, let’s discuss the materials used here. The surface we’re using is PastelMat paper (See my review of this paper). This paper is specifically branded and designed for pastel applications, but any drawing medium can be applied to it. The surface is relatively smooth compared to other pastel surfaces. This makes it suitable for subjects where smooth gradations of tone and value are a must. 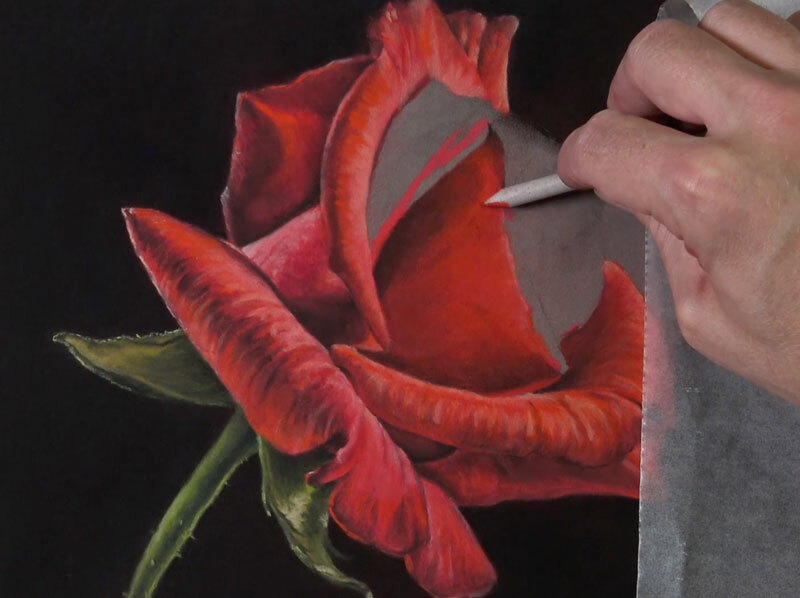 Even though the surface is fairly smooth, it still has enough grit to accept multiple, layered applications of pastel – which is important for any pastel drawing that you create. It is available in various tones. The paper features one side suitable for mark-making and is supported on the backside with a waxy, thick backing. Each sheet includes its own cover sheet which also doubles nicely as a protective barrier while working on the art. Rembrandt pastels are artist-grade pastels that are used by professionals. They are quite rich in pigmentation and are available in just about any color you can imagine. The pigmentation does affect the behavior of the pastels. Some colors are more difficult to layer over, while others are covered with ease. This characteristic steers some artists away from this brand. However, after using several different brands of pastels over the years, these are still my favorite. These artist-grade pastels are very pigment-rich. They are extra-soft, spreading strong color as they are applied. They easily cover applications underneath and are blended with ease. They are a bit pricey, and their life is relatively short (since they are so soft). The pencils are thicker than ordinary pencils, so a larger pencil sharpener may be used. They can also be sharpened with blade (which is how I prefer to sharpen them). They are so soft that they are easily broken during use. However, this trade-off is relatively minor since the quality of the mark is exceptional. 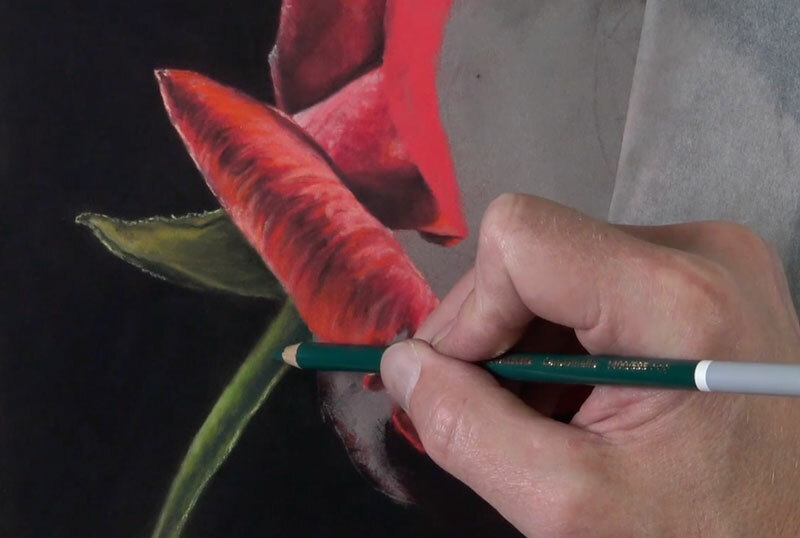 While the softer Conte a Paris pastel pencils are great for coverage and some of the details, the CarbOthello chalk pastel pencils handle the details with more precision. These pencils provide excellent control, which can be difficult to achieve with pastels in general. They are harder than some of the pastel pencil options, but this characteristic is also what makes them great for precision. They are the size of a regular pencil, so sharpening them is a breeze with a regular pencil sharpener. 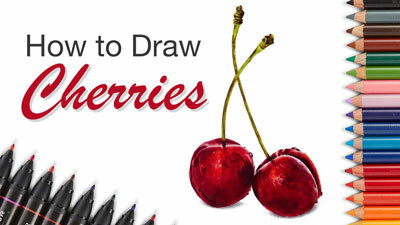 Now, let’s take a closer look at the step by step process used to complete this drawing. As mentioned before, we begin with a simple contour line drawing (or graphite transfer). It’s important to avoid placing too much pressure on the tip of the graphite pencil when creating the line drawing. 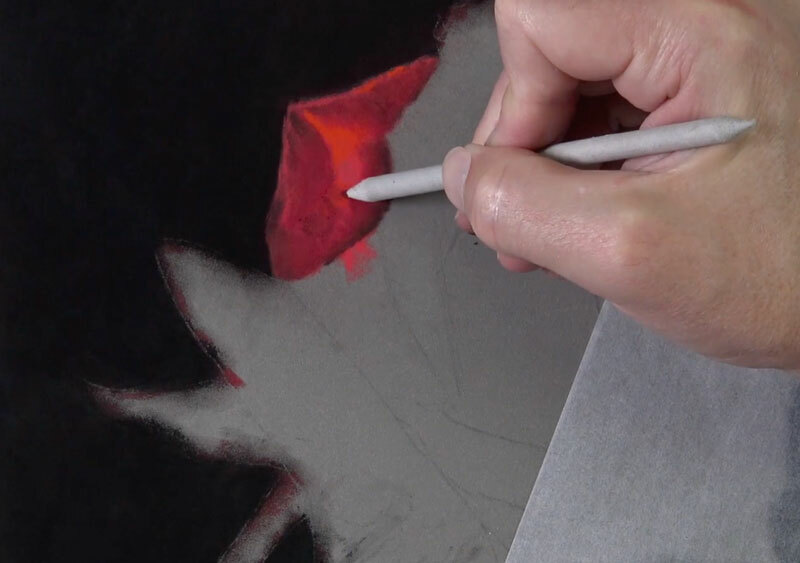 It’s easy to create indentations in the PastelMat paper which will be visible when applying the softer pastels. After the line drawing is in place, we’ll start addressing the background. Since we can cover pastel applications with additional pastels, it makes sense to work from the areas farthest away from the viewer to the foreground. We’ll begin with an application of black and cover the entire background space. Black on its own, however, is very strong and can make a color drawing or painting appear flat and unnatural. In this case, we want to create strong contrast between the rose and the background, but we still need the image to appear natural. 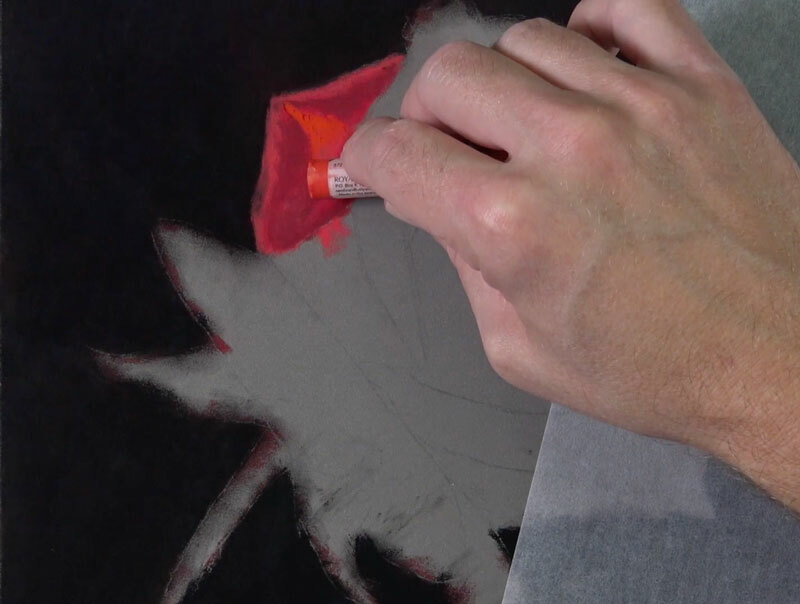 To preserve a strong contrasting background while keeping a natural appearance, we’ll apply a dark red over the black applications and blend them with a finger or blending cloth. After applying the dark red, an additional application of black is applied and blended. The result is a dark background that maintains a hint of color. For this image, we’ll address each petal of the rose individually. You could address the rose as whole if you prefer, but since we’ll address each petal with the same set of colors we’ll still create a sense of unity approaching the subject in this manner. Just as we considered the background as the area that is farthest from the viewer, we’ll approach the petals in the same way. We’ll begin with the petals that are the farthest away and work forward. The only caveat to this is the positioning of your hand. If possible, we want to avoid laying the palm of our hand over areas of the drawing that we have already addressed. This means that you may have to skip around in the drawing, and abandon the “front to back” approach for some the petals. We’ll begin our first petal with a solid application of a base red. It’s a good idea to choose a base color that is close to a middle value. 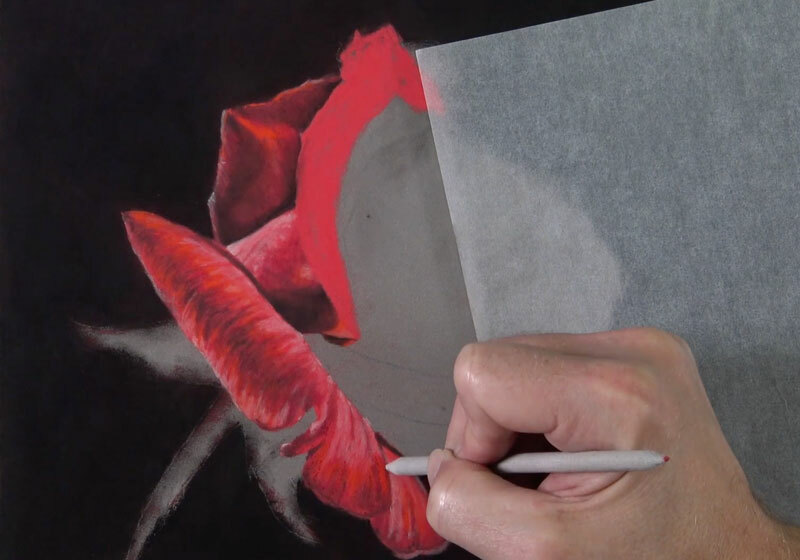 This allows us to “push” the values for each of the petals either darker or lighter to create the illusion of form and texture. By using the same base color throughout the drawing, we also ensure a bit of harmony. After the base color is in place, we can layer both warm and cool reds of slightly different values over the top. 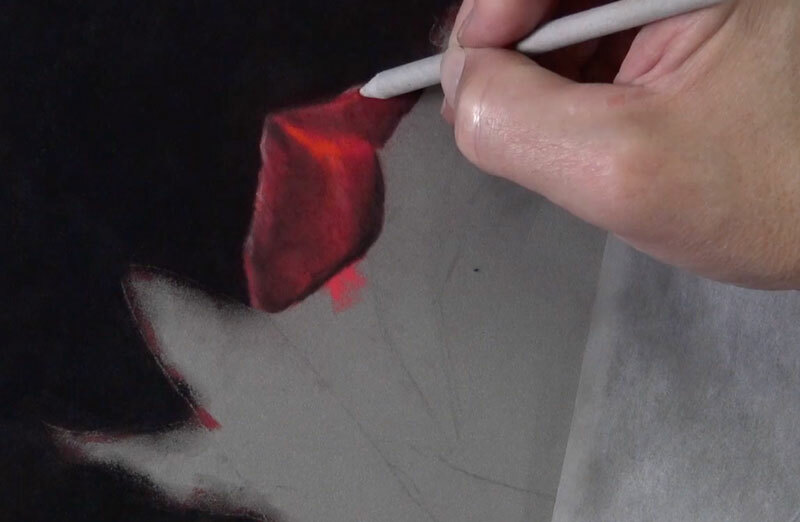 We can add a bit of black with a pastel pencil to push the darker values and subtle shadows on our first petal. These applications are then blended with a blending stump. 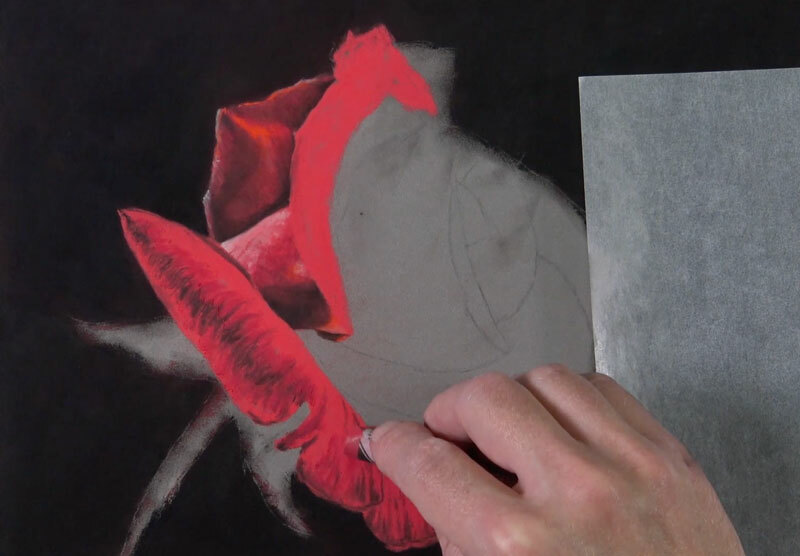 Be sure to blend the applications using directional stroking that matches the texture of the petal. The PastelMat paper provides a great surface for work with blending tools, providing a bit more precision. We’ll continue to gradually push the value range and increase the contrast with additional applications of black over the red underlayment. We’ll also add a few strong highlights with a pink and light peach pastel pencil, before blending again with the blending stump. With our first petal in place, we have a set of colors and a repeatable technique that we can use on the remaining rose petals. By using the same colors and the same approach for each of the petals, we ensure consistency and create harmony in the drawing. We’ll next continue to the next set of rose petals that overlap the first. Remember, we’re also considering the placement of our hand as well. Since I’m right-handed, I’ll stay primarily on the left side of the drawing as long as I can to prevent any unwanted smudging. Lay down the base red with a solid application. Apply cool and warm reds of various values. Adjust dark values by applying black. Add highlights with lighter red (pinks and red-oranges). Blend layered applications with a blending tool. As we progress through these steps, we’ll also continue to consider the directional strokes that we make. 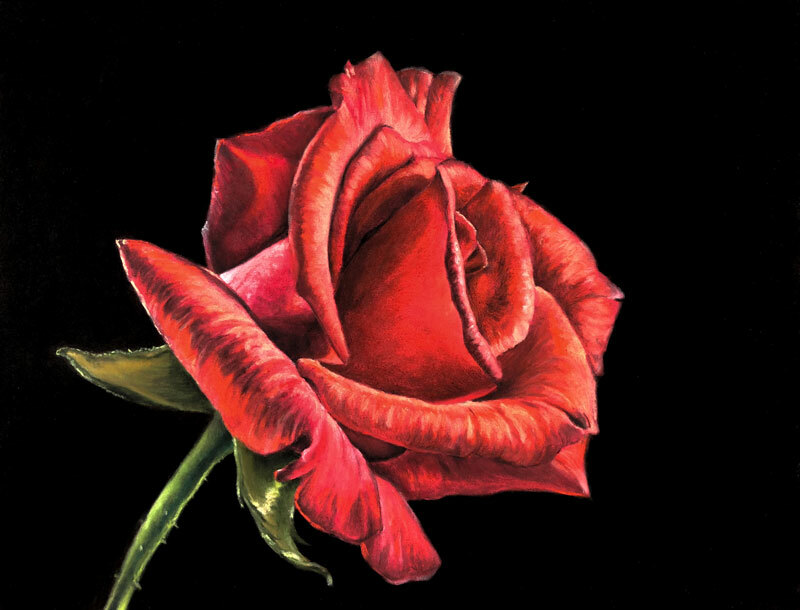 These strokes, often referred to as “cross contour lines“, should flow over the form of the petal. This means that the directional strokes will change direction for each new petal and most circumstances, change direction within each petal. We’ll take a break from drawing the rose petals for a moment and address the stem and the leaves. Even though this section is different in color, we’ll still use the same technique for developing the form and texture. Once the base application of yellow-green is in place, we can develop the darker values with black and the lighter tones with a lighter, earthy yellow-green. Each layered application is blended with the blending stump. On the stem, the same colors are used with the exception of a darker, blue-green which is added in the area of core shadow. Notice that since we have two light sources, the core shadow is found near the center of the stem. We see highlights, addressed with light yellow-green, on either side of the body of the stem. With the leaves and stem in place, we’ll go back to developing the rose petals. As we work closer to the dominant light source, on the right side of the picture plane, we’ll begin adding more of the warmer reds and less of the cooler ones. 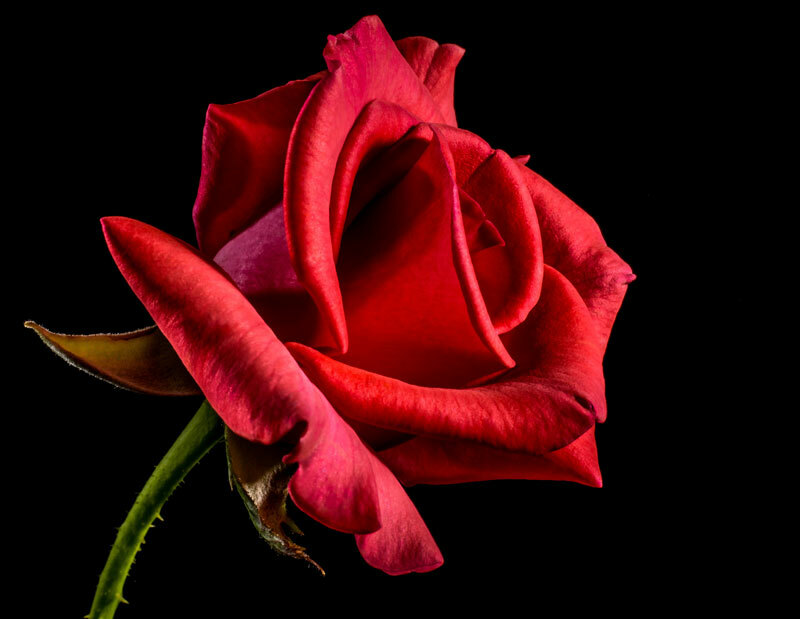 Most of the cooler reds exist mainly on the left side of the rose. We’ll also use more of the lighter red-oranges (peach) to address the highlights. As we develop each petal, we’ll gradually work our way to the center. Take note of how the large, exposed side of the petal pictured below is rather smooth in surface texture. Instead of leaving defined strokes, as we have thus far, we’ll smooth these applications with the blending tool to reflect the texture observed. At this point, only a few rose petals remain. 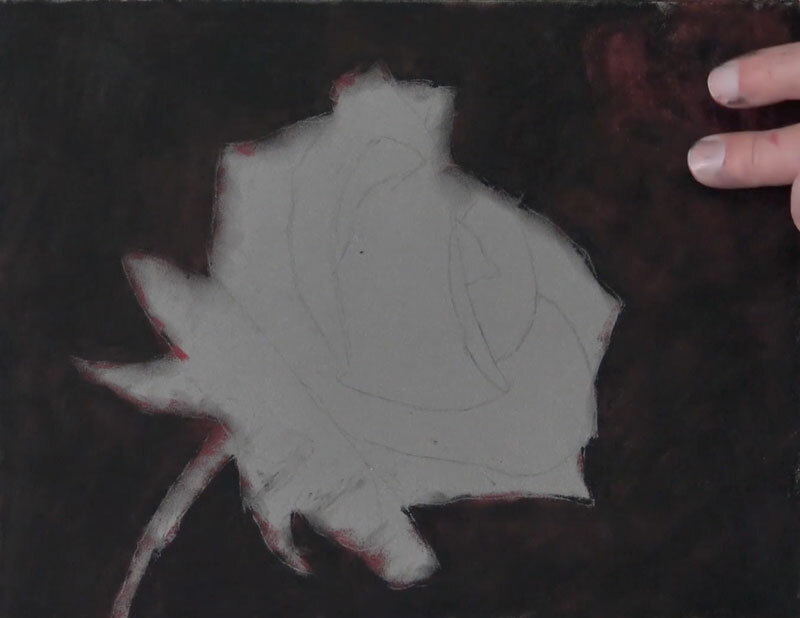 But before addressing the very center of the rose, we’ll add the petals on the extreme right side of the flower. These petals are developed first, since the center of the rose overlaps them. We’ve finally made it to the center of the rose. Now we’ll just draw in the last remaining petals. We’ll continue to follow the same approach – using the same technique with the same order of colors. The drawing is almost complete. Just a few finishing touches remain. We’ll next address the small portion of the petal that overlaps near the center. This area is rather small, so after the base color is applied, only pastel pencils are used to develop the value. Like with any pastel drawing, some excess dust will inevitably find its way into areas that you did not intend. While we make efforts to clean things up as we go, we may find that we need to tidy up the drawing further when we’re complete. In this case, quite a bit of pastel dust has made its way into the darker background. In order to preserve the strong contrast, we can use a finger or a blending cloth to blend this excess dust away. 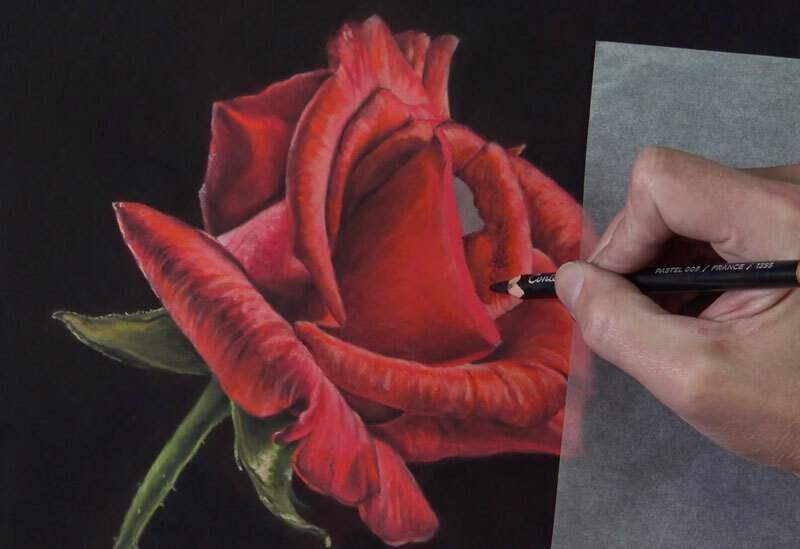 To refine the edges of the rose, a black pastel pencil is used where a finger would do more harm than good. 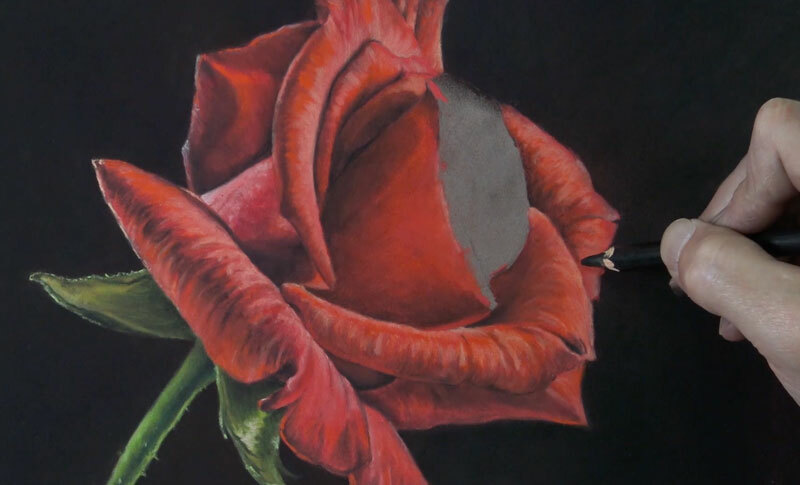 Now, our drawing of a rose with pastels and pastel pencils is complete. Thank you Matt.Stunning rose.I love the play in values creating the delicate velvety texture that the rose possesses.